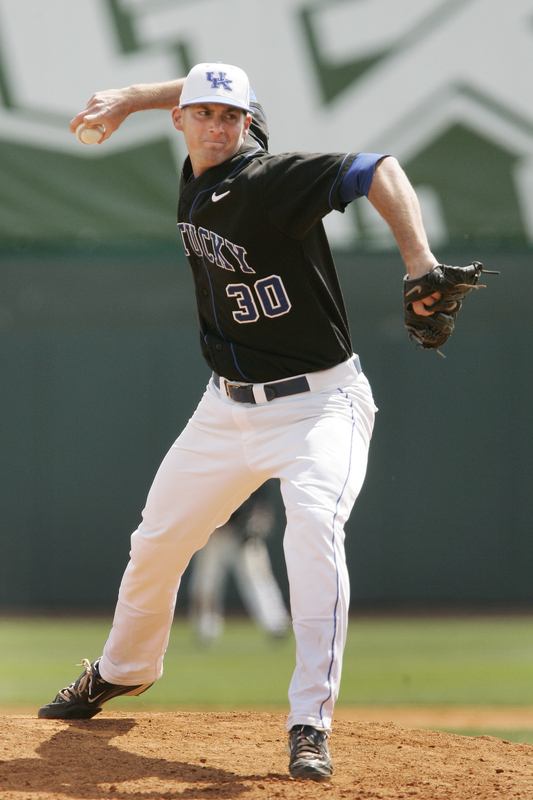 Louisville native and former Bellarmine right-handed pitcher Todd Wellemeyer announced his retirement today, effective immediately, Carrie Muskat of MLB.com reports. Wellemeyer signed a minor-league contract with the Chicago Cubs in the offseason and entered Spring Training with a chance to earn one of the team’s open starting rotation spots. Wellemeyer pitched well in the spring, posting a 1-2 record an 4.50 ERA in three games, but was slowed by a hip injury. Wellemeyer made his only appearance of the season on Thursday for AAA Iowa, surrendering four runs on eight hits in three and two-third innings while striking out two batters and walking two. Wellemeyer ends his MLB career with a 32-34 record and 4.83 ERA in 208 games over parts of nine seasons. Wellemeyer struck out 459 batters and walked 305 in 614 and two-third MLB innings. He mad 75 starts in his career. The right-handed pitcher’s best season came in 2008 when he was 13-9 with a 3.71 ERA and 134 strikeouts in 32 starts for the St. Louis Cardinals. The Cubs selected Wellemeyer in the 4th round of the 2000 draft out of Bellarmine. He made his MLB debut on May 15, 2003. The Cubs traded Wellemeyer to the Florida Marlins on March 28, 2006, and the Royals claimed Wellemeyer off waivers in June of that same season. 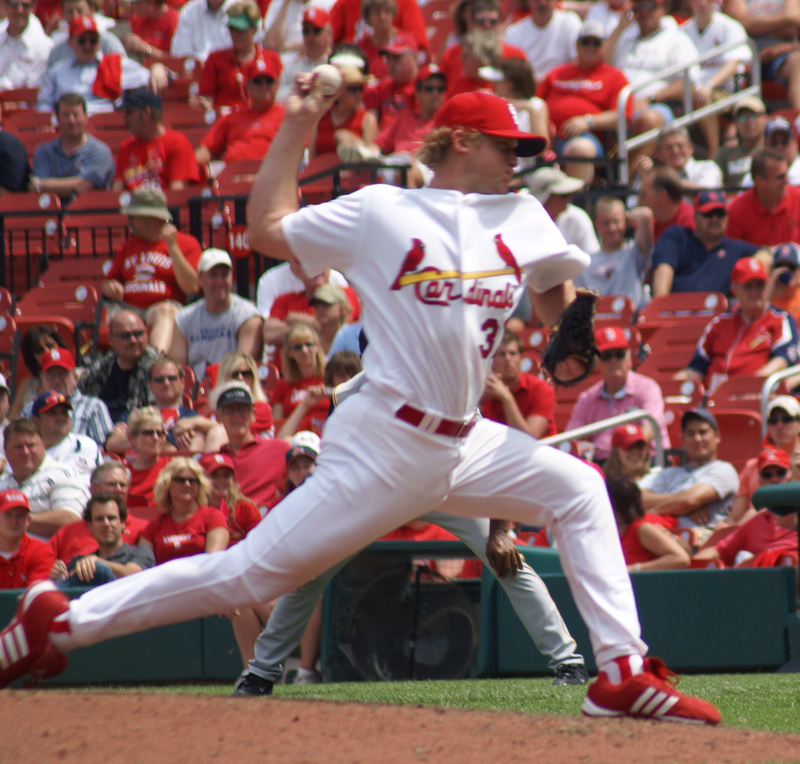 Wellemeyer joined the Cardinals in 2007 then signed as a free agent with the San Francisco Giants before the 2010 season. He made 13 appearances for the world-champion Giants last season, before the team released him in August. He returned to the Cubs on a minor-league deal in January. Guy Curtright of MLB.com reports the Milwaukee Brewers have optioned Louisville native and former UofL right-handed pitcher Sean Green to AAA Nashville. Jonathan Kleppinger of the Jessamine Journal reports the lawyers for Lexington native and Cleveland Indians outfielder Austin Kearns filed a motion in Jessamine County to dismiss the drunk-driving charges against Kearns resulting from his Feb. 12 arrest because the Lexington police officer who pulled him over was out of his jurisdiction. Richard Durrett of ESPNDallas.com reports the Texas Rangers scratched Ashland native and former UK right-handed pitcher Brandon Webb from his scheduled Thursday start in extended spring training, option to have the former Cy Young award winner work on his mechanics during a bullpen session instead. The Minnesota Twins have added Lexington Catholic alum Ben Revere to the MLB roster after placing outfielder Jason Repko on the disabled list. Western Kentucky University senior catcher Matt Rice and University of Louisville junior infielder Ryan Wright have been named to the Golden Spikes Award midseason watch list. The award goes to college baseball’s best player and is administered by USA Baseball. Terez A. Paylor of The Kansas City Star reports the Royals may put Elizabethtown native and right-handed reliever Nathan Adcock in more high-pressure situations after his first MLB win. Mark Maloney of the Lexington Herald-Leader catches up with some former Lexington Legends who are contributing at the MLB level with the Houston Astros. Lexington native and former UK outfielder Collin Cowgill was named the player of the week in the Pacific Coast League after batting .640 with 2 HR, 7 RBI and 8 runs last week. Eastern Kentucky University freshman infielder Bryan Soloman was named the co-Ohio Valley Conference player of the week. Madison Central High School dropped its first game of the season last night with a 5-0 loss to Bryan Station High School. Aaron Fitt of Baseball America highlights Western Kentucky University senior catcher Matt Rice in his weekly “Golden Spikes Award” spotlight. Gordon Wittenmyer of the Chicago Sun -Times reports Louisville native and former Bellarmine right-handed pitcher Todd Wellemeyer missed an opportunity to start for the Cubs early this season due to a hip injury, but is close to returning to game action with the Iowa Cubs and still may fill an important role for the MLB team. Jon Heyman of Sports Illustrated ranks University of Kentucky junior right-handed pitcher Alex Meyer the No. 20 prospect in the 2011 draft, noting he could go anywhere from a top five pick to the sandwich round. Richard Durrett of ESPNDallas.com reports Ashland native and former UK right-handed pitcher Brandon Webb was at 78 to 81 mph during the first two innings of his latest extended spring training appearance. Jason Frakes of the Courier-Journal runs down the high school top 25 matchups at this week’s Louisville Invitational Tournament. Derrick Goold of the St. Louis Post-Dispatch reports Louisville native Trever Miller has been struggling recently as the Cardinals’ only left-handed reliever. Miller has not recorded an out in his last five appearances. Paul Sullivan of the Chicago Tribune reports Louisville native and former Bellarmine right-handed pitcher Todd Wellemeyer is scheduled to pitch this week for AAA Iowa. Thomas Harding and Nick Kosmider of MLB.com reports Colorado Rockies right-handed pitcher Aaron Cook, who was born in Ft. Campbell, will throw a simulated game on Wednesday as he rehabs from a broken finger. Mike Fields of the Lexington Herald-Leader profiles 16-0 Madison Central High School in his most recent high school notebook. 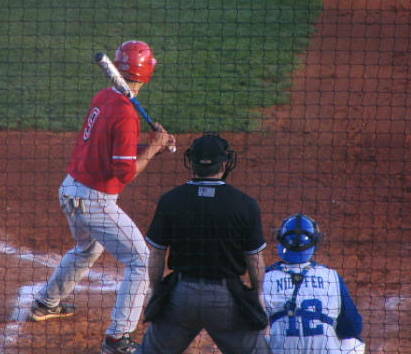 Herald-Leader columnist Mark Story also talked to me this week about BluGrass Baseball for his latest column. Matt Gelb of the Philadelphia Inquirer reports former UK right-handed pitcher Joe Blanton was placed on the 15-day disabled list with a “medial impingement” in his throwing elbow. Phillies GM Ruben Amaro Jr. said Blanton’s MRI was encouraging because it showed no structural damage. Charles F. Gardner of the Milwaukee Journal-Sentinel recaps Bowling Green native Corey Hart‘s wild night in his first start on Wednesday since returning from the disabled list. Gordon Wittenmyer of the Chicago Sun-Times reports Louisville native and former Bellarmine right-handed pitcher Todd Wellemeyer is at least a week away from game action. Steve Dilbeck of The Los Angeles Times reports the Dodgers have optioned PLD alum A. J. Ellis to AAA Albuquerque to make room for previously injured catcher Dionner Navarro. Adam McCalvy of MLB.com reports Bowling Green native Corey Hart will return to the Milwaukee Brewers today, but may not be immediately activated from the disabled list. Michael Grant of the Courier-Journal profiles Louisville Bats outfielder Danny Dorn, who only committed to baseball full time after a shoulder injury ended his football career in high school. University of Kentucky redshirt junior catcher T. J. Daugherty was named the UK male scholar athlete of the year at Monday’s Catspy Awards. Former Western Kentucky University star pitcher Matt Ridings notes via Twitter that WKU senior catcher Matt Rice was named the school’s male scholar athlete of the year at a Monday banquet.